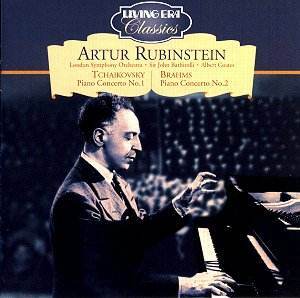 Now twenty-three years gone, Artur Rubinstein remains to this day one of the most popular and beloved pianists in the world. His myriad recordings, which span more than six decades and cover hundreds of works, are a living testament not only to a great artist, but stand as a document of the progress and maturity of a man, who though always possessed of tremendous talent, was not always in control of his technique. These two performances, nicely remastered and annotated by Living Era show the pianist as a still relatively young man, and reflect the result of his five year personal exile from the stage, a time in which he practiced for twelve to sixteen hours a day, and reemerged as one of the greatest pianists of the century. Doubtless even as long ago as 1932, the Tchaikovsky concerto must have attained its warhorse status. Rubinstein and Barbirolli present a flashy but not self-indulgent rendition. Tempo choices are brisk but not too fast, and the rather lush slow movement is taken at a serene pace, not overtly romanticized. Rubinstein plays with panache and aplomb, tossing off the arpeggiated passages with ease and thundering away in octaves with a great deal of power. The editors here hold background noise from the 78-rpm originals to a minimum, and the fullness of the sound is not hampered by the noise reduction. The Brahms performance was the first complete recording of the work, and was hampered in production by a number of difficulties which included inadequate rehearsal time, the soloist and conductor having to be placed at opposite ends of the room and temperature fluctuations which caused the piano to fall frequently out of tune. These poor conditions contribute to a somewhat uneven performance, and as he was somewhat want to do, Rubinstein blurs over some of the faster passagework and drops enough notes for even the casual listener to notice in the first movement. The latter three movements, however, are much more even, perhaps owing to the musicians� adjusting to the adverse recording conditions. A difficult work to keep together both structurally and technically, Coates takes tempi that are faster than what later in the century became the norm. However, it should be noted that conductor and soloist alike had studied the work with musicians who had known the composer personally and had played it for him. It can be reasonably assumed that the performance here is very close to the composer�s intentions as related by himself. Special notice must go to the LSO principal cellist (name unknown at this writing) for the lovely third movement solo, which is played to perfection, and captured rather warmly even in this primitive sound world. Living Era have issued a number of popular releases to wide acclaim, and it is delightful to these ears that they have decided to plow into the classical repertory. This series (I also reviewed a recent Stokowski release from the same group of releases) is obviously geared more to the artists than the music itself. To that end, the program notes deal heavily with the performers bios and with the circumstances under which the recordings were made. This makes for interesting reading, and kudos goes to David Patmore for his excellent program essay. Thus far, everything that has come across my desk from this series has been more than worthy, and we can only hope for a long and continually interesting stream of issues from this label. Strongly recommended, especially for historical buffs.